Memory foam, also known as visco-elastic foam, gets its name because it is very slow to return to its original shape, thereby "remembering" the shape and contours of your body. Originally developed by NASA to protect astronauts against extreme g-forces, memory foam is known for its ability to mold itself to your body and support it evenly. By making contact with more of your body, the pressure of the mattress is spread over a greater portion of your body's surface area, thereby reducing stress on your shoulders, hips, and other pressure points. No mattress is made of 100% memory foam. Rather, manufacturers typically use between 1 and 5 inches of memory foam as the top layer of a mattress, supported by regular foam or springs below the memory foam. So when a retailer or salesperson refers to a mattress as a "memory foam mattress," they mean that a mattress contains some amount of memory foam, not that it's made entirely of memory foam. Made from polyurethane, memory foam consists of billions of little air-filled cells. Like a tiny balloon, each cell contains a small amount of air. However, unlike some other foam cells, memory foam cells actually decompress under pressure, particularly if the pressure is accompanied by heat. Thus, when you lie down on a memory foam mattress, the foam cells closest to your body slowly release their air, creating a unique melting effect and allowing the mattress to conform to the shape of your body. Similarly, when you get up, the foam cells slowly refill with air, which is why it takes a few moments for the mattress to return to its original shape. Different memory foams recover their shape at different rates. In our Expert Mattress Reviews, we note whether a memory foam bed is 'slow responding' (meaning it take several seconds to come back to its original shape) or 'fast responding' (meaning it returns to its original shape quickly). What is the Best Memory Foam Density? 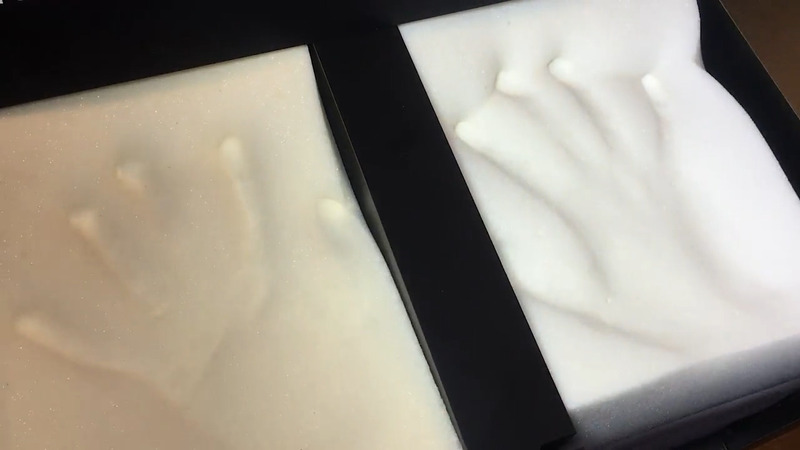 In GoodBed's evaluations, we use the "density" of a given memory foam to judge its quality, as measured by the weight of one cubic foot of the material — i.e., pounds per cubic foot (lbs/ft3). In mattresses, memory foam can most commonly be found in densities ranging from 2 to 6 lb. density, with most high-quality manufacturers using memory foam with a density of 4 lbs. or greater. Most (but not all) manufacturers disclose the density of their memory foam on their websites. Generally, a higher density memory foam can be expected to be more durable and resistant to body impressions (permanent depressions that can develop over time). In general, the thicker the layer of memory foam, the deeper your body will sink into the mattress, which is a matter of some personal preference. Conversely, the denser the memory foam, the less your body will sink into the mattress. Higher-end manufacturers tend to use a thicker top layer (e.g., 3-4 inches or more) of high-density memory foam (e.g., 5 lbs. or greater) in such a combination that the greater firmness of the high-density memory foam is offset by the greater depth of the memory foam layer. This approach enables them to create a well-balanced, supportive feel, using foam of the highest durability, albeit at a relatively higher cost. Pressure relief. Memory foam has excellent pressure-relieving qualities, a benefit for those with joint-pain issues, or for those who sleep primarily on their sides. Memory foam typically allows the heaviest parts of your body to sink more deeply into the mattress, such as shoulders and hips. Body conformance. If you like feeling hugged or cradled by your mattress, the "melting" sensation of memory foam is worth consideration. Some mattresses have more of this quality and some have less of it. Just be aware that some memory foam beds will give you more of that 'sinking in' feeling, and others less. Motion isolation. Like all foam, memory foam absorbs movements very well, so a person on one side of the bed is less likely to be disturbed by movements on the other side. That makes memory foam mattresses in general a good choice for couples. Why Are Foam Mattresses Hot? Foam beds in general do not provide as much airflow as mattresses that include springs. And memory foam in particular has more body conformance, meaning you sink in more. That can all translate to feeling hot on a memory foam bed. Manufacturers use several techniques to combat this, including using gel flecks or other heat regulating additives. See Memory Foam and Sleeping Hot. Is Memory Foam Smell Toxic? Memory foam is a petroleum product, and like other types of foams, some consumers complain of off-gassing or chemical smells, especially when a mattress is new. In our testing, we often note a 'new mattress' smell that dissipates over a few days. But for those with acute sensitivities, it's worth consideration. Are the smells toxic? While unpleasant or off-putting, there is no evidence showing that the odor is harmful to health. For some people with sensitivities to perfumes and other smells, however, a new-mattress odor might trigger a headache or other reaction. Most foams used in modern mattresses, including memory foam, are certified to the CertiPUR-US standard, which means the materials have been examined and certified to have minimal levels of off-gassing. Read more about mattress certifications. Memory foam mattresses, especially those with high quality, high density foam, are a lot heavier than an innerspring mattress. And that means to prevent sagging and body impressions, your foundation needs to be up to the task. Manufacturers of memory foam beds will recommend types of foundations and frames that will best support the mattress to prevent sagging. You'll at least want a substantial box-style foundation or platform bed. What's the Best Memory Foam Mattress to Buy? Many manufacturers use memory foam in their models; the most well-known is Tempur-Pedic, the Swedish mattress company that first figured out how to adapt NASA's technology for use in beds. Other well-established manufacturers have added beds with memory foam to their lineups; examples include Sealy's Cocoon mattress and Serta's iComfort Blue 100, both of which have been reviewed by GoodBed. Online mattress companies are also in on the memory foam game. Examples include the GhostBed Luxe, the Nectar mattress and the Layla bed. GoodBed has reviewed all of these mattresses, including substantial discussion on the quality and support of each bed's memory foam. Just click on the links of each to read more. Are Memory Foam Mattresses Better Than Innerspring Mattresses?